Jewish Humor Central: What Do Los Angeles Cantors Sing When They're Not Singing on the Bimah? Karaoke, Of Course! What Do Los Angeles Cantors Sing When They're Not Singing on the Bimah? Karaoke, Of Course! What do cantors do when they're not singing Rosh Hashanah and Yom Kippur liturgical compositions? If they do their cantoring in Los Angeles, they let their hair down and sing some popular karaoke. In this video, Los Angeles cantors sing a cover of "Stand By Me" in the style of Ben E. King. 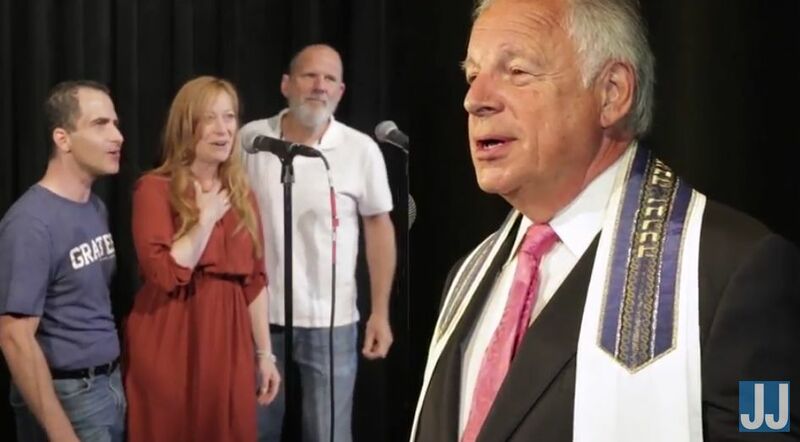 It's the first of a series of Cantor Karaoke videos produced by the Jewish Journal of Los Angeles. It features Cantor Nathan Lam of Stephen Wise Temple, Cantor Joseph Gole of Sinai Temple, Cantor Chayim Frenkel of Kehillat Israel, Cantor Shira Fox of Beit T’Shuvah, Cantor Yonah Kliger of Temple Judea and Rabbi Cantor Alison Wissot of Temple Judea. Joyful & current especially appropriate in these difficult times. Terrible! Actually the girls were pretty good but the guys should stay with the service in shul.